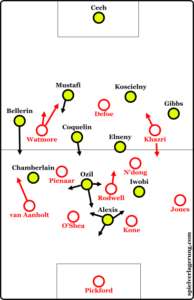 Even in the early moments of the game, Arsenal had no trouble using the right-side to build-up. Re-circulating from left to right was particularly easy during semi-transition, because Duncan Watmore’s positioning during these moments was often deep and narrow. Perhaps to maintain compactness in the centre of the pitch or to drop in and mark an Arsenal midfielder after poor positioning from Sunderland’s midfield trio. This narrowing from Watmore was important to ensure Arsenal were not able to simply bypass Defoe and move into midfield, but also created a large distance between he and Hector Bellerin. This consistently allowed Arsenal to quickly gain 10-20 yards whenever the Spaniard received the ball. It is unlikely this was Sunderland’s planned pressing scheme, given Watmore’s strict man-marking of Bellerin during defensive organisation. It also seemed to reduce the impact of Pienaar in pressing phases, who seemed to screen similar angles to Watmore (although this may have been purposeful due to the South African’s declining physical ability). The Sunderland response to Arsenal building down the right also seemed to lack co-ordination. Standard pressing scheme from Sunderland. Defoe and Watmore attempt to stop easy central penetration, but this simply allows Bellerin to receive the ball in a huge amount of space. In many cases, Pienaar was slow to recover in these situations. Primarily the full-back would look to engage Bellerin, but Rodwell would also shift across if necessary. When this happened, the rest of the Sunderland midfield did not pendulate with him, and a large pocket was created between them. This was particularly common if N’dong was occupied with a runner in transition, who he would choose to track instead of covering the vacant space. As the half went on and Bellerin’s influence became more obvious, Watmore began staying wider. Obviously this reduced Bellerin’s impact, but also opened the centre. At this point Pienaar was often tasked with screening an Arsenal midfielder whilst also aggressively closing down Mustafi, who was the key man in horizontal re-circulation situations. Simple movements out of his cover shadow from Ozil made this very easy to bypass. As Arsenal’s control grew, the need for them to progress from deep reduced as Sunderland reduced their pressing to their own third. As with many Premier League teams, Sunderland’s defenders tend to follow opposition runners away from their zone. 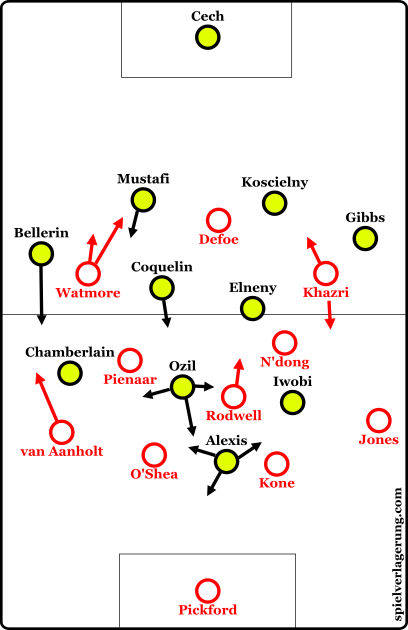 This was a common theme throughout the game, and Arsenal took advantage of this primarily using third-man runs and other diagonal movements. With Alexis as the striker, the typical centre forward space was often vacated as he dropped deep into midfield to receive the ball. Sometimes he was followed by a Sunderland central defender, but occasionally not. If he was allowed to move back unattended, then the near-side Arsenal winger would make a diagonal movement into the vacated space. This can provide a potential throughball route. Alternatively, if the winger is followed, it can disrupt the positioning of the near-side CB/FB and create a pocket of space for a teammate to move into. A diagonal run such as this can destroy a man-oriented defense, but can also be difficult for a zonal-focused defense to co-ordinate, particularly if the movement behind the defense is well timed. During the first half though, the Arsenal play between the lines (when the lines actually existed) was poor. Many players on the same horizontal line restricted the passing options of the receiving player, and they relied on these co-ordinated, improvised movements rather than organised spacing. At times in the first-half, Sunderland were able to create a nice structure for diagonal balls that allowed them to take advantage of chaotic second ball situations. This was even without a dominant aerial threat to win deliberate knock-downs. However, this seemed to lessen in the second half as Defoe became more and more isolated. Whilst this disconnect was evident in Sunderland’s build-up, it also created problems in their low-block defense. 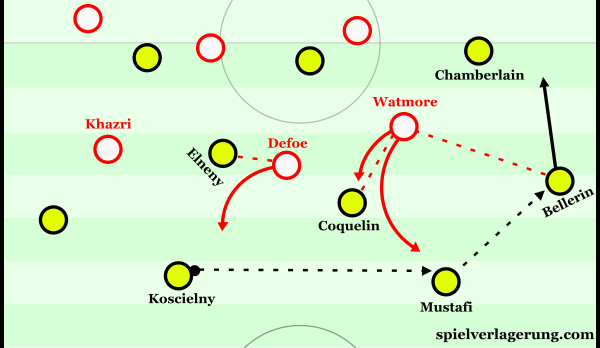 With the flat five across midfield, Defoe was tasked with pressing both Arsenal central defenders with little help or pendulation from his midfielders. This meant an Arsenal defender (generally Mustafi) was able to easily progress 10-15 yards forward, disrupting the positioning of nearby Sunderland players. This also created more favourable passing angles for breaking through the midfield. After Sunderland’s equaliser, Arsenal reacted well and continued to improve. This dominance coincided with the arrival of Olivier Giroud from the bench, but the impact of Sunderland’s substitute should also not be understated. Once Januzaj came on, positioned on the right of Sunderland’s midfield, Arsenal were easily able to progress down that side. This was partly due to the same issues Watmore had earlier on – a poor pressing structure forced Januzaj to push forward and inwards, but his disconnect with teammates allowed him to be easily bypassed. Khazri had been less enthusiastic about pressing or working hard, which meant those spaces weren’t so easily created. A deep-press is better than a disconnected one, particularly given Defoe had also given up offering any defensive resistance at this point. In his deeper role on the left, Alexis could also position himself in line with the Sunderland midfield, using his superior turning speed to accelerate away whilst receiving on the halfturn. Januzaj’s advanced positioning allowed him to isolate in 1v1s if he was slowed down on the turn. Sunderland’s forwards being so disconnected from their midfield in pressing phases meant the likes of Watmore were expected to cover huge spaces during Arsenal’s build-up. Obviously this was easily bypassed and merely resulted in unnecessary fatigue. Moyes and his team largely gave up on an aggressive press at half-time, and dropped deeper in an attempt to keep things tight at 0-0. One of the key features of Arsenal’s attacking play is read-and-react movement based on teammates’ positioning, particularly when attacking a low block. This can cause major spacing issues for them if the opposition defense is organised and co-ordinated, which can also effect their transition defense. Sunderland’s defenders were instead easily manipulated and were often dragged away from their zones. With such co-ordination issues in their defense, it was only a matter of time before Arsenal were able to take advantage.